November 3, 2016 - Erik Sargent and Landon Wilcox are the two recipients of the 2016 Union Wireless Scholarships awarded to Utah State University Engineering students. Both students were honored at a luncheon hosted by Union Wireless in Logan, Utah on October 13th, 2016. Landon, also a junior studying computer engineering, plans to graduate in the fall of 2017. Landon is the son of Lamont and Heidi Wilcox of Farmington, Utah. “I’m overwhelmed by the generosity of Union Wireless. My sincere appreciation goes to those who made this scholarship possible,” noted Landon on being chosen as a recipient. 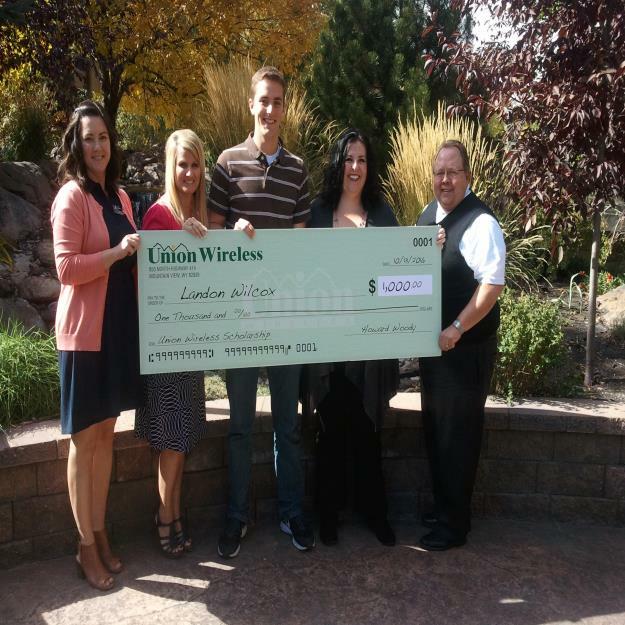 According to Frank Draney, Director of Human Resources for Union Wireless, “The scholarship program was set up to support students in local communities who are interested in pursuing a technical field education in the Rocky Mountain region.” In addition to scholarships, Utah State students have worked summer internships and have accepted full-time positions at Union Wireless. “We feel these initiatives support students in their pursuit of excellence as well as enhance the partnership between our company and the university,” added Draney.